Sleaford Laffletics Disability Sports Club this week said goodbye to one of its founder members. Following 11 years with the club, having helped set it up, Sally Baxter is going into semi-retirement. In her time with the club, she has served as treasurer, coach, chairman, mentor and much more, helping to keep the club running. 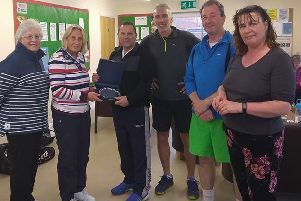 Team Laffletics are sorry to see Sally go but celebrated her involvement this week by way of a vote of thanks and a presentation of a £50 voucher from members, parents, coaches and volunteers, with flowers and a signed card from the Laffletics committee. Tony Martin (representing members and parents) and John Curnow (coaches and committee) are pictured presenting Sally with her gifts.